EVA Airways has announced it will be accelerating the retirement of its entire Boeing 747 passenger fleet, bringing forward the final flight from October to August 2017, China Aviation Daily reported. Previously scheduled on Oct. 28, 2017, EVA Air's final 747 service is tentatively scheduled on Aug. 20, 2017 from Shanghai to Taipei. The Taiwan-based carrier currently operates three 747-400 aircraft, which are still the largest in its fleet, but these aircraft will be gradually replaced by new long-haul jets, including the Boeing 777-300ER. 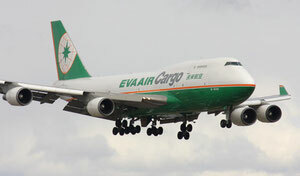 EVA Air Cargo, which markets the belly hold space on the carrier's passenger fleet as well as main-deck capacity of its freighters, will continue to operate a fleet of seven B747-400 freighters until from October onwards. It starts gradually phasing in the five B777 freighters which it ordered in 2015. All five 777Fs will be in operation by September 2019. The carrier also has 24 Boeing B787-10s on order.